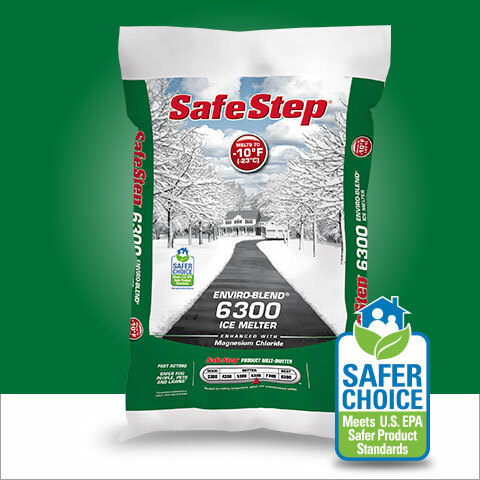 Safe Step Enviro-Blend 6300 is safer to people, pets and vegetation when used as directed, but has a melting power that outperforms other ice melter blends. The patented formula contains our powerful melting catalyst, MG 104®, which helps prevent refreezing up to 2 ½ times longer than conventional products. Designated a "Safer Choice" by the U.S. EPA, Safe Step Enviro-Blend 6300 demonstrates our commitment to the health and safety of people, pets, plants and the environment. © 2019 SafeStep All rights reserved.